Why have one pudding when you can have three?! This gorgeous dessert combines a rich lemon tart base with a caramelised brûlée crust and crisp, sugary meringues. Using ready-made mini meringues is a handy shortcut, but you can of course make your own if you like. To make the pastry, blitz the flour, icing sugar and a pinch of salt in a food processor. Add the butter and orange zest; pulse to fine breadcrumbs. Gradually add the egg while blitzing. To make by hand, stir together the flour, icing sugar and salt in a bowl. Add the butter and zest and use your fingertips to rub the butter into the flour. Drizzle over the egg and quickly mix with a butter knife until it comes together in large clumps. Shape into a disc and wrap in clingfilm. Chill for 30 mins. On a lightly floured surface, roll out the pastry to the thickness of a pound coin and use it to line the base and sides of a 25cm loose-bottomed tart tin. Prick all over with a fork and trim the edges. Chill for at least 30 mins. Put a baking sheet in the oven and preheat to gas 6, 200°C, fan 180°C. Line the pastry case with baking paper and fill with baking beans or uncooked rice. Put on the hot baking sheet and bake for 15 mins. Remove the paper and beans, then bake for another 8 mins. Remove from the oven then reduce the temperature to gas 1, 140°C, fan 120°C. Whisk the eggs and 200g caster sugar until combined. Whisk in 200ml lemon juice and the zest, then the cream. Carefully pour into the pastry case. Return to the oven and bake for 30 mins. Meanwhile, scorch the tops of the mini meringues with a blowtorch or under the grill to caramelise. a thin, even layer, then scorch with a blowtorch or briefly under a hot grill. 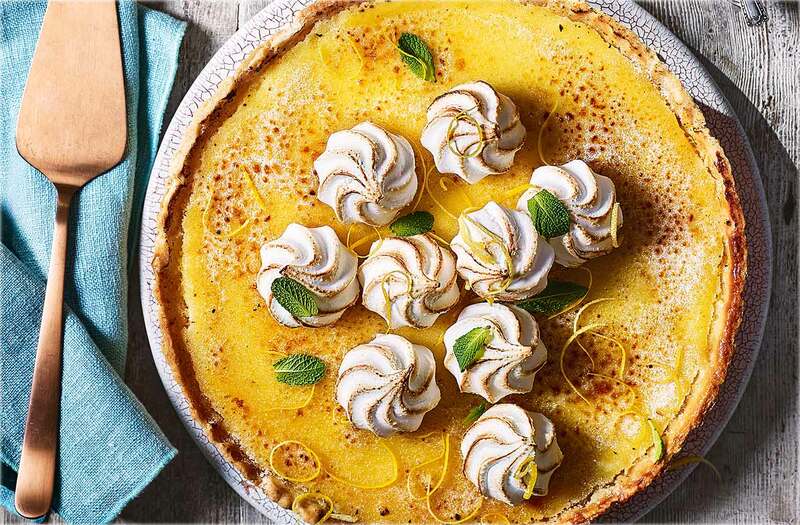 Decorate with the toasted meringues, lemon zest strips and mint leaves. Tip: You’ll have 190g pastry left over – wrap it tightly in clingfilm and freeze for another recipe.